3DP Is Beginning To Open Store Fronts On Main Street. Retail Entrepreneurs See Startup Opportunities In Bringing 3DP Equipment, Services, Supplies And Training To The Local Community. Some 3DP Services Are So Novel That They May Make Retail Locations Into Experiential Destinations. 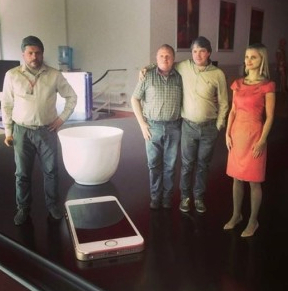 Will 3DP’d “Personal Figurines” Create A Craze And Draw A Crowd…? Lining up outside the Artec Shapify.Me 3DP-Scanning Booth at Asda’s first “Personal Figurine” creation system near Manchester, U.K.
Gotta 3DP crystal ball? Wanna know where the AMR (Additive Manufacturing Revolution) is going? Well, some 3DP gurus and savants think the future is in the past. They say: study the history of the PC in commerce and society, note the milestones, discern the match-ups with AMR and then plot the upcoming path of 3DP development. All well and good—but I have another prognosticator’s mode. I suggest you get down into the grassroots and see what is happening at the local retail level—among those small business people who are 3DP true (commercial) believers, early biz adopters, prescient ‘preneurs and money-where-their-mouth-is risk takers. Sometimes those “entrepreneurs” are actually “intrapreneurs” at large corporations. Sometimes—against all “corporate common sense” (think hyper-conservative, group-think behavior)—major companies will roll the commercial dice. Let’s take a look at one of those large intrapreneurial companies in the UK — one that continues to make waves with 3D printing. Let’s peruse the 3D printing-based “risky behavior” of ASDA, a major grocery chain. Asda is one of the four largest supermarket chains in the UK, the British arm of Wal-Mart of the US. Another organization NOT noted for its technical (or, these days, any other kind of) risk-taking. The figure of the shopper is created and constructed using 3D body (clothed!) scans and a 3D printer. 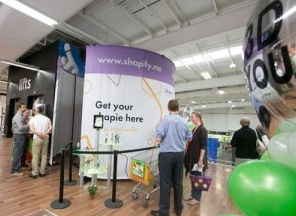 Walk into the Artec “Shapify.Me” booth (a large, open-topped, circular affair, actually big enough for “two-shots”of a pair together) at the Asda’s first installation (in Trafford Park near Manchester) and pose for 12 seconds. Inside the Artec Shapify.Me 3DP-Scanning Booth at Asda’s first “Personal Figurine” creation system near Manchester, U.K.
“The image is then processed and sent to the ZPrinter 650, a photo-realistic 3D printer manufactured by 3D Systems [Corporation of South Carolina]. An eight-inch tall [full-color] figure is printed out using layers of ceramic powder. Customers can pick up the model a week later.” [Note that Asda—gets another guaranteed interaction with the customer on pick-up-–although the end product could be mailed or overnighted.] This “pick up” mode is a VERY valuable add to the process of brand-building and ancillary-shopping opportunities. The Asda, full-color, figurine images ARE uncanny. The quality stems in part from Artec’s professional and industrial history in scanning and in part from the 3D Systems professional printer. Artec employs “leading experts in the sphere of capturing/processing of 3D surfaces, as well as face recognition.” And, it shows. 3D scanning/printing of a person could be considered a tangible form of photography. We may be back to the way we once held the 2D photograph in our hands—except now the subject is fully modeled in the Z-axis and can present themselves “live” in the round. 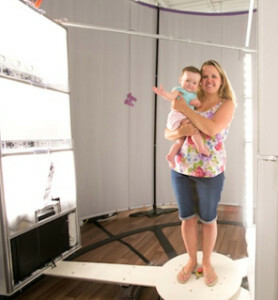 Artec says that their full-body, booth-mounted 3D scanner is the first of its kind in the world. Asda’s example “Personal Figurines” shown on a tabletop (see iPhone and tea cup for size comparisons) at a supermarket near Manchester, U.K.
At Asda, the 3DP results won’t come cheap for customers. Each figure will cost £60 (or about $102). For now, Asda is only offering the 3D scanning booth at the Trafford Park store. [Hey, if this initiative doesn’t work, the supermarket chain's store-network won’t be widely exposed to failure!] According to Asda, the chain hopes to bring the service to other stores by early September 2014. Asda is—by dint of being a chain of local supermarkets—down in the grassroots gambling on an innovative use of 3DP for regular customers on their premises. I thought I’d get another opinion from a grassroots 3DP retailer and—OBTW—also a consultant to other retailers interested in employing new 3DP innovations in winning ways and means in their own local stores. So, I interviewed Liza Wallach Kloski, Co-Founder of HoneyPoint3D, Northern California’s first, and (currently) only, dedicated Retail 3D-Printing Stores. HoneyPoint3D offers rapid prototyping, 3D Printing, 3D Modeling, 3D Scanning, Intro Classes, Business Services, Consultations and 3DP-Focused Corporate Events. HoneyPoint3D has a location in Montclair (Oakland), CA and now one in San Mateo, CA. Liza further says her company partners with Artec and owns two of that company’s high-end scanners. She opines that a “lot of people are getting into scanning. [They] don’t need a great deal of experience and knowledge. It’s your way to interact with 3D printing [and get started]. This is an easy entry to 3DP…the novelty and the new hottest high-tech. Scanning can be considered modified photography. “Lots of big box retailers want to get into it…[From a customer-facing point of view] 3D scanning is great way to get people involved [with the store] as a fun and savvy thing to do [with new and exciting 3DP technology]. I can also see a “play” for existing, small retailers. Starting with the new 3DP stores—as another add to 3DP’s “experiential destination” magnetism. Further: consider the implications of “personal figurines” as a form of 3DP photography. We may see the rebirth of “photo studios” as “3D studios” delivery portraiture in-the-round. What other retailers might become 3DP ExperDests? Who provides milestone records now? (Event halls and wedding photographers.) Diaries of life? (Day spas and fitness centers.) Or, spontaneous moments of fun for the capture? (Restaurants and bars.) On a more strategic level, town merchant blocks or shopping malls may wish to provide 3DP “stations”—to help draw shoppers for the good of the retailer community. All these scenarios suggest that—at the least—the “personal figurines” or “3DP photography” may indeed morph into a fad or craze. Better—and I think more likely—is this technology becomes a long-lasting trend in the way people see themselves and want to be seen by others—and also the basis for Experiential Destinations where such services are on offer.